Homemade ricotta is much softer and smoother than the grocery store brands. Since Chef Iggy has started making it every week or so, we've found lots of new uses for it - from a pasta garnish to desserts. The texture of homemade ricotta is close to yogurt, and we often substitute it for Greek yogurt in recipes. It's the easiest cheese to make. Try it yourself and you'll never go back to the hard, rubbery stuff from the grocery store. As you drain the ricotta, the watery whey separates out. Whey has a mild tangy flavor similar to buttermilk, but the texture isn't as thick. Don't let it go to waste! Save the whey and use it to cook collards, or marinate pork or chicken. We even use it in baking. Drain the homemade ricotta well. 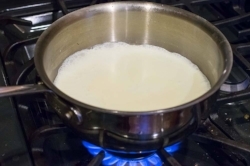 In a medium saucepan, simmer the milk and cream until they almost reach boil. Add salt, lemon juice and vinegar, then stir. Remove from heat and let sit for 30 minutes to curdle. Ladle the curd mixture into a fine strainer (a chinois or a cheesecloth-lined colander) and let sit over a bowl for 5-10 minutes to drain off the whey. Use homemade ricotta any way you would store-bought ricotta. It is delicious layered in lasagna, and has enough moisture content that you can use dried noodles. A spoonful makes a creamy topping for pasta bolognese or our sweet potato gnocchi. Dab ricotta on pizza, or spread it on bruschetta and top with fresh tomatoes and basil. Or add sugar, shaved chocolate and vanilla to stuff into cannoli.